Micro CHP has implications not only for the immediate installation, but also for the electricity system to which it is connected. This section, therefore, also covers related technologies, products and concepts which are either essential to enable the operation of micro CHP within the national infrastructure, or which enhance the performance or value of micro CHP products themselves. 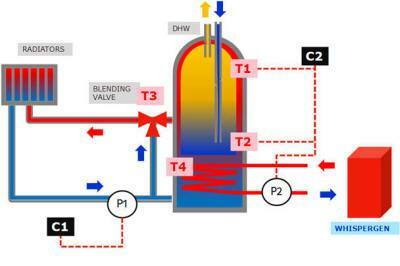 Thermal storage offers significant benefits to micro CHP for a number of reasons. Firstly, a substantial thermal store allows the unit to produce electricity when it is most valuable, and avoid export to the grid, which in some markets (such as Japan) remains a challenge. A substantial thermal buffer store minimises cycling, leading to improved engine life, minimising parasitic losses, and maximising the electrical output of the micro CHP unit. It also extends the range of potential applications for a given micro CHP unit as smaller homes can be served without concern for cycling and larger homes benefit from the stored heat capacity to meet higher peak loads, (including rapid recovery of domestic hot water), minimising the use of the supplementary burner usually included in micro CHP systems, and thus maximising electrical output for a given thermal load. On a rather prosaic level, thermal storage also allows the micro CHP unit to be physically separated from the existing primary heating circuit in the home; this has often proved a source of contamination leading to reliability and performance issues. Electrical storage, in combination with microgeneration, can, in principle, meet the entire electrical needs of the home without the need for grid connection, providing "grid independence". However, the majority of micro CHP products are currently intended for grid-parallel operation as this represents by far the biggest market in the developed world. Despite this, recently there has been a growing interest, triggered by developments in the German FIT arrangements for PV systems, towards incorporating some electrical storage to maximise utilisation of generated power within the home. This export avoidance mechanism also minimises adverse impacts of PV generation on the network in summer during low demand periods. However, this is relatively unimportant for micro CHP which generates most during peak winter demand periods and when any export is of significant value to the system. Beyond this, however, electrical storage can have significant value in its own right, providing useful services to the grid and the overall energy system. For more information on this see papers. The control of micro CHP operation has profound implications both for the home and for the national electricity network to which it is connected. From the householders' perspective, the ability to match generation to demand will enhance the value of the micro CHP output. From a generator's or network operators perspective, there are potential benefits in micro CHP acting as a "Virtual Power Plant", centrally controlled and acting within the national generation portfolio. However, whoever has control of micro CHP generation, there are clearly benefits in aligning output with periods of high value (economically and environmentally) electricity. Unfortunately, at present the focus seems to be on optimising load and generation to match generation with household consumption which, whilst superficially beneficial (at least from the householders'' point of view) does little to address the significantly higher value elsewhere within the system. Traditionally, electricity has been centrally generated and distributed down through the network to individual consumers, being metered at point of consumption. Entire infrastructures have been developed to measure and manage this process. The need to measure and attribute an appropriate value to generation flowing from the home raises challenges for metering technology and for the related infrastructure. This is compounded in markets such as the UK where the energy industry has been fragmented to the extent that it is extremely time consuming and cumbersome to implement changes to the metering and settlement system, requiring consensus of numerous parties with often conflicting interests. For more on the value opportunities and the need for reform, see the section on papers.